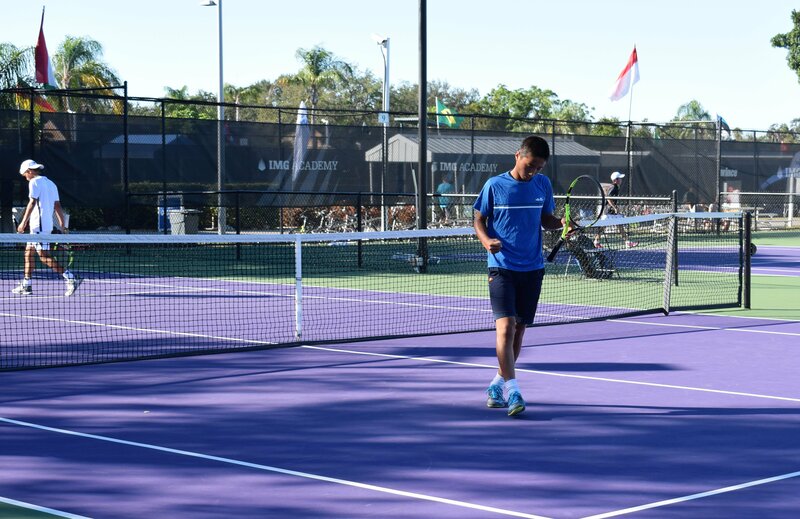 What started with over 1,400 juniors from 80 countries beginning November 27th came down to the final competitors on Saturday and Sunday (December 2-3) of the 2017 Eddie Herr International Junior Tennis Championships. Held at IMG Academy in Bradenton, FL, the 31st annual event drew players, parents, college coaches, fans, sponsors, and countless other spectators to campus to view the on-court battles that could make or break a junior player's year-end finish. One player who took complete advantage of the opportunity ahead of her was 15-year-old Whitney Osuigwe, an IMG Academy Ascender herself. Osuigwe's run commenced on Monday, November 27th, and continued through the week, dropping her first set of the tournament in the final round on Sunday. Osuigwe's 2017 campaign took off after her French Open junior singles title on June 10th. From there, she also claimed the Asuncion and Banana Bowls and the Pan-American ITF Championship. Sitting at the ITF No. 1 junior ranking coming into December, Osuigwe is hopeful of how her year may end. "Whitney has faced the challenge of finishing with the world No. 1 junior ranking with great poise and grace," Margie Zesinger, Head of Girls Tennis at IMG Academy said. "She is displaying the game and maturity it will take to climb the ranks at the WTA professional level. Taking the Eddie Herr title at her home court was very special for all of us who have seen her grow up here." Osuigwe produced some of her best tennis this year, and she's not putting her racket down just yet. After a record-finish at home, winning both the Girls 18s Singles title and claiming the Girls 18s Doubles crown with partner Caty McNally, Osuigwe also seeks a run in the upcoming Orange Bowl, a Grade A ITF event, beginning December 4-10. Over 60 student-athletes from IMG Academy were among the competitors of the main draws of this BG 12-18s event, and several Ascenders saw their names in the final rounds of the event as well. 17 different courts on the fifth day of the event saw IMG Academy tennis student-athletes competing, thus, each of them earning their rank amongst the semi-finalists or better this year. Claiming the Boys 14s title was Shintaro Mochizuki, who's been on the rise with the program quite recently. "Shintaro had an amazing tournament, but this was not a surprise," Juan Herrera, Head of Boys Tennis at IMG Academy said. "He is on the upswing this semester with great results. Shintaro is playing a very unique, aggressive style of tennis that is not only great to watch, but also very effective. We are very happy and excited for him and what lies ahead for his tennis." Along with his trophy, Keenan Mayo battled for the Boys 18s doubles crown with partner Adrian Andreev, defeating fellow Ascender Alan Rubio and his partner Dostanbek Tashbulatov in the final. Nicolas-David Ionel fell just short of the Boys 16s title in the finals, and Lennon Jones claimed the Boys 12s finalist finish. With the home court advantage comes pressure, confidence, support, and so many other emotions, but the IMG Academy family, both among the tennis program and other departments and sports, stood behind all of the competitors until the final day. A program that produces an event of this caliber while still ensuring each player has the necessary encouragement and resources remains in a realm of its own. To learn more about joining these players in the new year, visit our website, and contact us today.